Description: This book, first published in 2000, deals with the micromechanical characterization of polymer materials. Particular attention is given to microhardness as a technique capable of detecting a variety of morphological and textural changes in polymers. A comprehensive introduction to the microhardness of polymers is provided, including descriptions of the various testing methods in materials science and engineering. 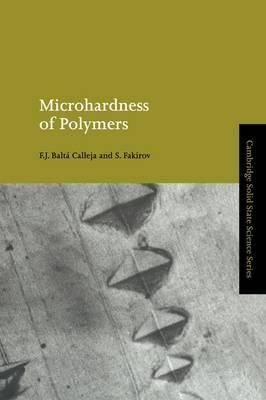 The book also includes the micromechanical study of glassy polymers and discusses the relevant aspects of microhardness of semicrystalline polymers. The volume also presents selected application examples of the microhardness technique for the characterization of polymeric materials, including the influence of polymer processing, the use in weathering tests, the characterization of modified polymer surfaces, and others. This book will be of use to graduate-level materials science students, as well as research workers in materials science, mechanical engineering and physics departments interested in the microindentation hardness of polymer materials.